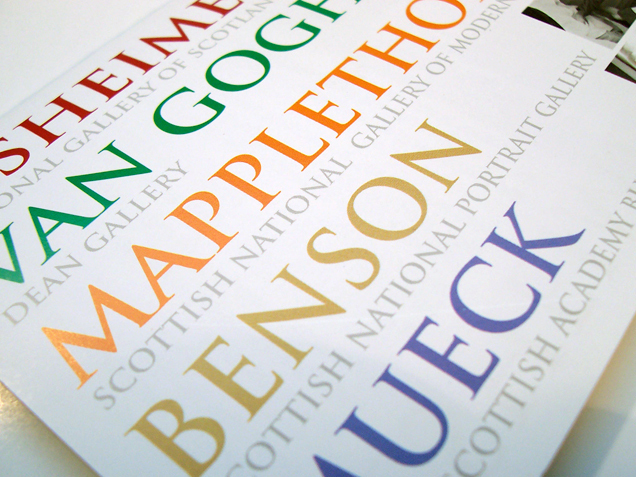 We worked with the National Galleries of Scotland on several direct mail and below the line promotion items for their many exhibitions, including some posters and signage requirements. They said we had produced “one of the best items of promotional work they had done for a long time”. The piece in question was inspired by the huge and imposing columns that are an integral architectural feature in all their galleries. The image (above) shows our solution for their 2006 summer season of exhibitions in which 5 exhibitions were to compete with each other over the whole summer but each had to be given equal billing. We took inspiration from the galleries themselves and their grand entrance columns, echoing this in the vertical typography. Evidence that we put great emphasis on creativity even for something as simple as a DL below-the-line leaflet.